Black Friday deal: Free five-star Naim Mu-so with Naim/Focal bundle | What Hi-Fi? 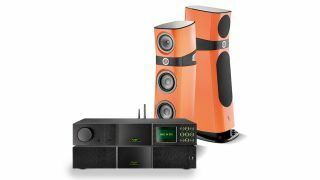 Through their specialist dealers, and until stocks last, Naim and Focal are now offering five-star Naim Mu-so (£895) and Mu-so Qb (£595) wireless speaker freebies with three system bundles (which themselves also include several five-star products). If you buy a Naim Uniti Star system (£3499, 5 stars) and pair of Focal Aria 936 speakers (£1799), you get a free Naim Mu-so Qb. Up your hi-fi game by purchasing a Naim Uniti Nova system (£4199, 5 stars) and Focal Kanta N2 speakers (£6999), and you get a Naim Mu-so chucked in for free. The ultimate freebie? A free Mu-so and Mu-so Qb, worth £1395. In other words, a very decent wireless multi-room speaker set-up. For that you have to invest pretty seriously in a Naim NAC-N-272 streaming pre-amp (£3300, 5 stars), Naim NAP 250 DR power amp (£3199) and Focal Sopra N2 speakers (£9999). But hey, if you were thinking of taking the plunge anyway, now may be a good time.